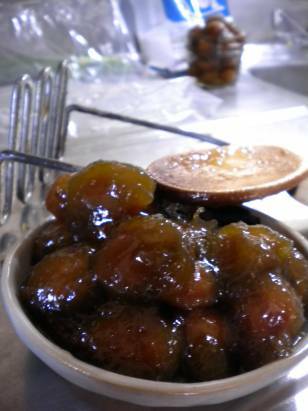 One of the leftovers of umehachimitsu are the plums or ume. Last year I made marmalade with the yuzu peels I removed from the yuzushu, but I never quite sorted out what to do with the ume from the hachimitsu or the umeshu. This year I decided to try making jam. Remembering the damson jam served from the larder of good friends in England and those sampled at Ludlow, I perused a few recipes. These simple ones and this one for plum butter caught my imagination, but for the first batch I thought I would keep additions to a minimum. The flavor would be different as these weren't fresh dark damsons plucked from the tree by Daniel's Mill, but rather these little fatties had loitered in honey and vinegar for a handful of months. In the end, I based my experiment in the Ball Blue Book recipe for damson jam. The resulting flavor is tart, salty, and sweet, and not quite what one might expect on morning toast. I think with cheese it would be lovely, although I am enjoying it very much on its own. It's also not an overly attractive jam - nothing like the octopus-resembling eggplant pickles - but it's still darn yummy. Place ume, sugar, and water* in a saucepan, and slowly bring the mixture to a boil. Stir continuously until the sugar dissolves, and stir regularly to keep it from burning. Once it boils, then continue boiling rapidly until the jam reaches a gelling point. 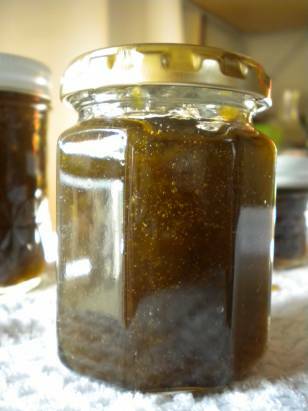 Remove it from the heat, and lade the hot jam into hot jars leaving a 1/4 inch head space. Process in a hot water bath canner for 15 minutes. Water - I opted to use some of the ume hachimitsu liquid for no reason other than the fact that it was on hand. It may have made it stickier and the flavor stronger overall. My next batch I will opt for the water and see what happens. Pits - Ume are a stone fruit, and while some folks opt to leave them in I decided they represented a high enough dental hazard that I should get them out. The ume skin proved rather resilient even after a fair amount of cooking, so I brought out my antique potato masher from America. (Pictured with the pits at left.) It crushed the ume nicely, which released the stones for me to spoon out. My husband later took them to the office as a unique sweet treat, and a co-worker said the taste reminded her of tamarind. Amount - By morning's end, I found myself looking at about three pints of jam. I was a little disappointed, to be honest, as I come from the land of big batches for big canners. Next year, I may commit a canning sin and simply double the recipe.